Finaly, one of Games-Workshops coolest tank are back in business. Thank you Forge World for bringing back all these good memories. 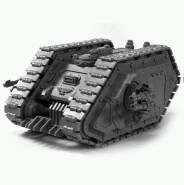 I believe that I soon will start a Space Marine army just because this tank.